Jérôme Fenoglio op-ed is titled "Resisting the Strategy of Hate." 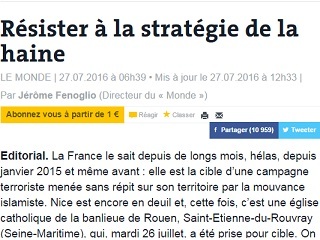 In an op-ed headlined “Resisting the Strategy of Hate,” Le Monde’s editor in chief Jérôme Fenoglio (pictured) writes that the latest home-soil ISIS attack, which claimed the life of 86-year-old priest Jacques Hamel, is designed to provoke “blind vengeance” and nudge an entire country into the “empire of hate.” France, which he writes must resist those urges, is being targeted in part because it is home to one of Europe’s largest Muslim immigrant communities, where terrorists hope to stir misdirected reprisals. Without a call to conscience at the companies controlling social media networks and new media, it will be more and more difficult to resist the effects of the strategy of hate. The strategy’s best allies – rumors and conspiracy theories – are effectively today put on the same level as information that is reliable and verified. Websites and newspapers that produce this kind of information can no longer exonerate themselves from introspection. The EIC says the discussion at his paper on how to improve the ways it sensibly covers terrorist attacks is ongoing. Photos of ISIS propaganda documents and Islamic State materials are also now on Le Monde’s no-publish list.